Zhang Yimou Joins Le Vision Pictures as Artistic Director | Radical Studios, Inc.Radical Studios, Inc.
HONG KONG – Zhang Yimou was unveiled as the new artistic director for Le Vision Pictures at a press conference in Beijing Monday, with the company also announcing the establishment of a production fund to be overseen by the director. 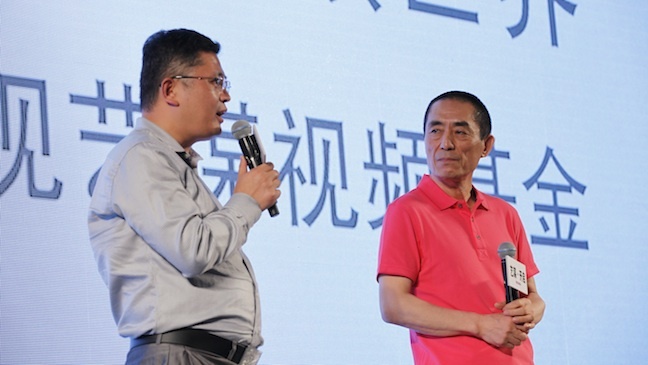 Flanked by Le Vision Pictures CEO Zhang Zhao and LeTV’s senior vice president Gao Fei, Zhang Yimou appeared at a press conference in Beijing to mark his new venture, with the company’s online portal letv.com also launching a section on its site dedicated to the director’s past films – a catalog which, the company said, will be made available on SuperTV, the Foxconn-made smart television sets LeTV will bring to the Chinese market in June. Le Vision also inked a deal in Beijing last month with Radical Studios, with their jointly owned company Radical Vision China lining up co-productions such as Clans of the Scared Stones, described as a “sci-fi blockbuster inspired by ancient Chinese literature” featuring “some of China’s most famous heroes.” Announced in the Chinese capital last month, the film is about a popular uprising against an evil emperor. But the announcement was made at an awkward time for both partners in the deal. Acknowledged as the Chinese government’s favorite filmmaker – he was assigned to choreograph the opening ceremony of the Beijing Olympics in 2008 – Zhang Yimou has been under fire recently as the Chinese press was inundated with reports about his having fathered seven children, a violation of the country’s one-child policy.